Being an island of Malaysia in Andaman Sea, Langkawi's one of the main mode of connections with other parts of Malaysia and neighboring countries is through boat or ferry services. There are several ferry routes and services that provide Langkawi's waterways. 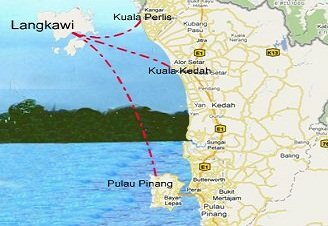 The nearest point linked with Langkawi by ferry is Kuala Perlis which is located 31kms to its east and on the western coast of Malaysia's main land. Other ferry points in Malaysia accessible from Langkawi includes Kuala Kedah (51kms away and at the north western coast of Malaysia's main land), and Penang (110kms away also at the western coast of Malaysia). Satun of Thailand is also connected through a ferry service from Langkawi. Kuah Jetty in Kuah town is Lankawi's main ferry point (or terminal) from where the ferries/boats leave and arrive. The entrance to Kuah Jetty is through a large & modern shopping complex. At the opposite side of the shopping center, i.e. on the other side of the road, there is a Tourist Information Center run by the Malaysia Government. You can collect free brochures and maps of various places of Malaysia including Langkawi, Penang, Kuala lumpur etc. from here. Following are the major Ferry Service operators providing the important links between Langkawi and the nearby places. The below section provides information about routes, the types of ferries, schedules, ticket counters, offices, reservation/booking information and more. Note: Schedules and fares are subject to changes. So check out with the ferry operator before making reservations. They have been operating since 1996 and is one of the largest ferry services of Langkawi. They have a fleet of high speed boats (presently 12 of them) with capacity varying from 100 to 200 seats and travelling at speeds between 30 to 40 knots (nautical miles per hour). All the ferries are air-conditioned, have on-board videos, reclining seats and small canteens. The service operates daily between Langkawi, and places like Kuala Perlis, Kuala Kedah, Penang, Puala Payar Marine Park and Satun (of Thailand). From Penang they also provide a connection to Medan of Indonesia (3 days a week). Penang to Langkawi: Daily 8:15am (via Puala Payar), and 8:30am direct. Adult RM60 one way and Child (up to 3 years) RM45. Langkawi to Penang: Daily 2:30pm (via Puala Payar), and 5:15pm direct. Adult RM60 one way and Child (up to 3 years) RM45. Penang to Medan: Monday, Wednesday & Friday; Check-in: 8.30am; Adult fare RM110 one way and Child (up to 3 years) RM60. Reduced two way fares. Medan to Penang: Tuesday, Thursday & Saturday; Check-in (Belawan): 10.00am; Adult fare RM110 one way and Child (up to 3 years) RM60. Reduced two way fares. The ferries operate from the Kuah Jetty in Langkawi. You can make advance reservations through their website, or alternatively email or call them with your requirements. All passengers are ferry insured. Note: You can buy tickets online from their website as well as from the counters. They have been operating since 2005 after having merged four companies. 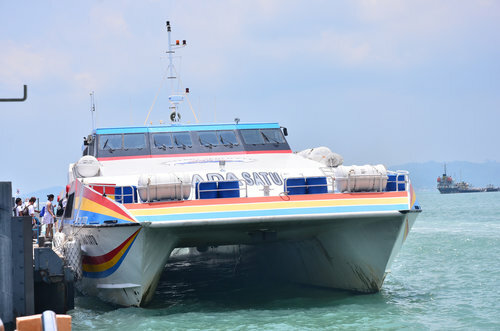 Their ferry operations has a fleet of boats with capacity ranging from 100 to 450, and presently connect Langkawi with Kuala Kedah and Kuala Perlis. There are daily regular ferry services between Langkawi and these two places. Bahagia Express runs speedboat ferry between Penang and Langkawi. The ferries leave from Weld Quay of George Town in the morning and come to Kuah Jetty in Langkawi. There are two ferries, one comes via Pulau Payar Marine Park and the other direct. The direct ferry takes 2.5 hours to reach. The return times are in the afternoon. One way adult fare is RM60. You should book the tickets in advance from their office in Penang. Their office is near the Clock Tower and next to the Tourism Board office. You can also book online through the website penang-online.com and collect your tickets at the counter "Ekspres Bahagia" 30 minutes prior to departure. This ferry service is for trips between Langkawi and Koh Lipe of Thailand. There are two daily ferries that operate each way during the high tourist season (i.e. between October to May). During the other months, the service remains closed. It takes 90 minutes to complete the trip one way. The distance between Langkawi (Telaga Terminal) and Koh Lipe is about 42kms. Telaga Terminal is located at the Telaga Harbor Park in Pantai Kok and opposite to Perdana Quay. The ferries depart at 9:30 and 14:30 hours from Langkawi (Malay Time) and leave Koh Lipe at 10:30 and 16:30 hours (Thai Time). Note that Thai time is 1 hour behind Malay time. One way fare is RM128, and return fare is RM248. Also note that there is no jetty or ferry dock at Koh Lipe. A long tail boat is used to transfer the passengers to a beach. Check-in counter opens 1hr 30mins before departure and closes 30mins before departure time. Remember to carry all your required travel documents including valid passport, visa (if required), filled up embarkation card, ferry booking voucher, Thai immigration card etc. Also carry enough Thai Bahts as there is no ATM at Koh Lipe. You can make online reservation at the website http://telaga-terminal.com. Note: There are other Thailand based operators who run ferries between Koh Lipe and Kuah Jetty of Langkawi during the high tourist season (check out www.kohlipethailand.com). Hello, We are a family of 6 who would like to go to Koh Lipe from Langkawi from July 28 to July 31. Can you give us any advice on how to get there. Thank you very much. Ferries leave for Koh Lipe from Telaga Ferry Terminal in Langkawi. Nowadays all Ferries to Langkawi boarded from Kuala Kedah and Kuala Perlis are monopolized by just a one company- Langkawi Ferry Line Ventures Sdn Bhd (they print out as Langkawi Ferry Services Sdn Bhd.). After 2003, there are no more 'original' LADA High Speed Catamaran Ferry/Boats operated by LADA Berhad. That is why the ferry ticket price increased surprisingly without any logical reason.. because people have no choice. They must get the only one company ferry. In fact, the safest high speed boats were from LADA Berhad.. they built very tough strong ocean vessels at Australia (if not mistaken), aluminum alloy based body. They could reach 36knot. Have a very sweet experience with LADA original water jet propulsion, smoothly driven the boat without knowing the boat engine is running.. well circulated air condition system within the large passenger cabin hall. They provided affordable cafeteria, and also premium seats at second floor. The LFS ferry company claims to have high speed boats but they are very dangerous when crash happens. The high speed as claimed is because they are using the un-approved fiberglass frame, lighter but brittle. This was recorded as a tragedy in early 2000 when collided with mud pontoon, the ferry wrecked into two parts.. So, not many people know that LADA (original fleets of LADA vessels series-LADA 1 until LADA-5) were the best public passenger ferry in Malaysia and very comfortable, safest and fastest. LFS boats move at high speed also but you will vibrate and it makes your ear deaf by the old type propeller engine.. pity to see that all these sweetness gone.. no more choice now.. Yes... as per current schedule (from Kuah Jetty): Langkawi to Satun: 4 trips daily. First trip at 9:45am, last trip at 4:30pm. Adult fare RM30 one way. You can contact Langkawi Ferry Service Sdn Bhd to know about any change in schedule before departure.